French onion soup is a dish I love to make. 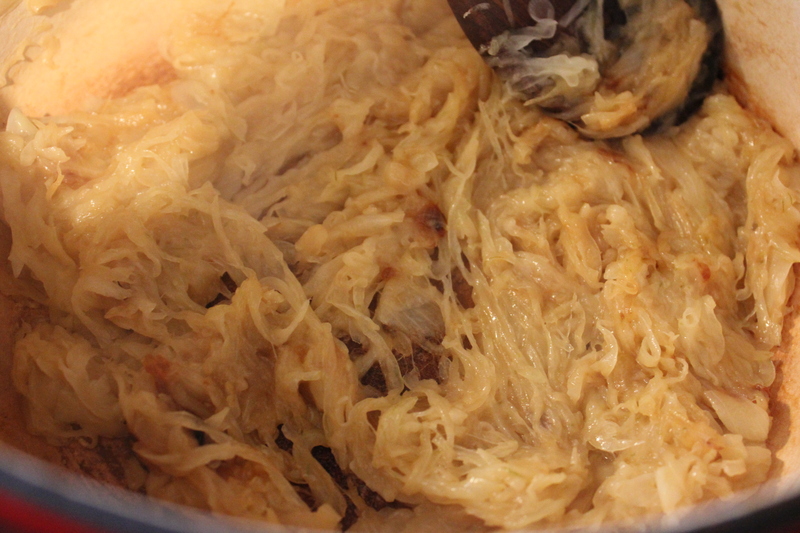 It’s therapeutic to stand over a pot of onions and coax them from their raw state into the sweet, tender and beautifully golden strands that make French onion soup so good. When my husband told me he didn’t like it, I pressed him. Why? This soup has EVERYTHING you love. Onions. Beef stock. Bread. Cheese — loads of awesome cheese. So what’s the deal? He claimed it was too messy. I solved the problem by using cubed bread and toasting it in the oven before adding the soup and cheese. It’s all the awesomeness of French onion soup without having to mess with a thick slice of bread. Getting the hang of caramelizing onions takes a few tries and a ton of patience. I couldn’t wrap my head around how long it really took to get the onions to break down. 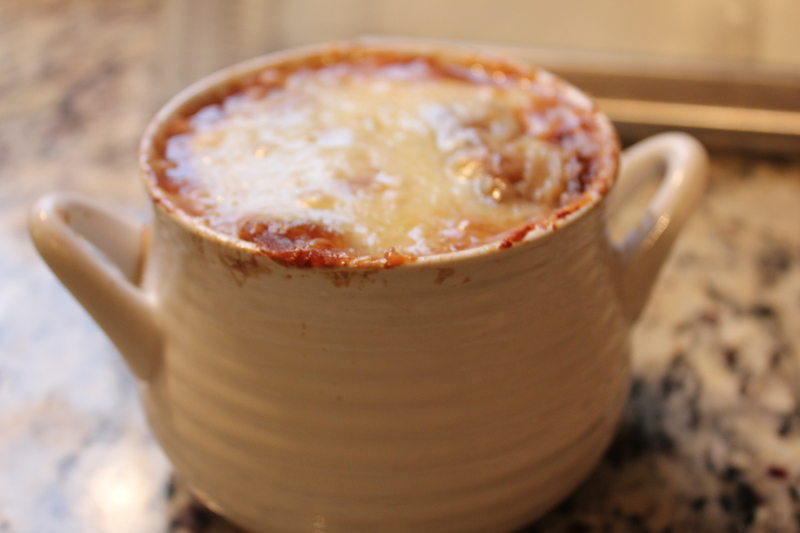 So if it’s your first try at French onion soup, check out the photos and guide to help you out. I show you step by step what your onions should look like and a time frame. Scroll down to the recipe if you already know the process. White or yellow onions work best for caramelizing. I use a mandolin to slice them as thinly as possible. It makes the process go quickly, too. 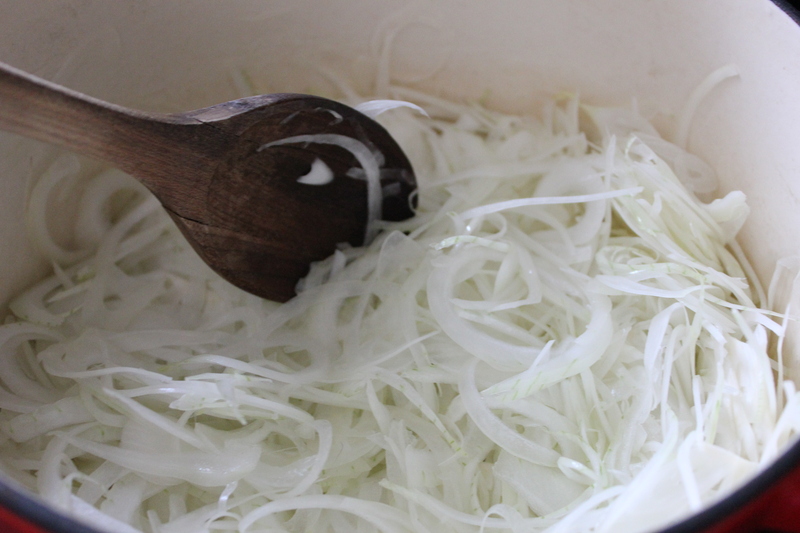 Add your raw onions to the pot with melted butter and oil on medium-low heat and give them a good stir to coat. Place the lid on the pot and let it cook for 10 minutes. Give it a stir then replace the lid and cook for another 10 minutes. Remove the lid and stir. Another 5-10 minutes and the onions will start to take on a light golden brown. 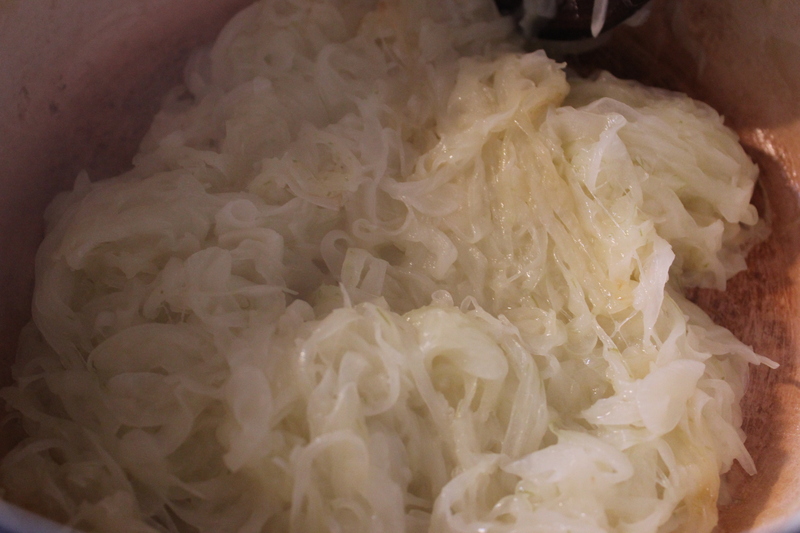 In the photo below you can see how the onions are soft and starting to break down. But seriously, 25-30 minutes in and this is all the further we’ve gotten? Ridiculous. You’ll want to keep an eye on your pot from here on out. The step of caramelized onions to burnt onions is shorter than you’d think. Crank up the heat to medium-high and add in your sugar and salt. In the next 10 minutes, your onions will start sticking to the bottom of the pot and develop a deep brown color. I see you little brown specks! Don’t hide from me! Stir them constantly to keep them from burning. Don’t worry about the layer sticking to the bottom of the pan. We’ll deal with that. Hurray! Your onions are caramelized. You can actually do something with them now. Make French Onion soup! Bring on the booze! Alternatively you can use this for a topping on burgers, in a dip, or for something else. Traditional French Onion soup uses white wine with beef stock. Whatever, fancy French cooks. I am more of a “what’s in the fridge” sort of cook. I’ve made this recipe with white wine, red wine, and beer. Use a dry wine – either a Sauvignon Blanc if you choose white or a Cabernet Sauvignon if you want to use a red wine. 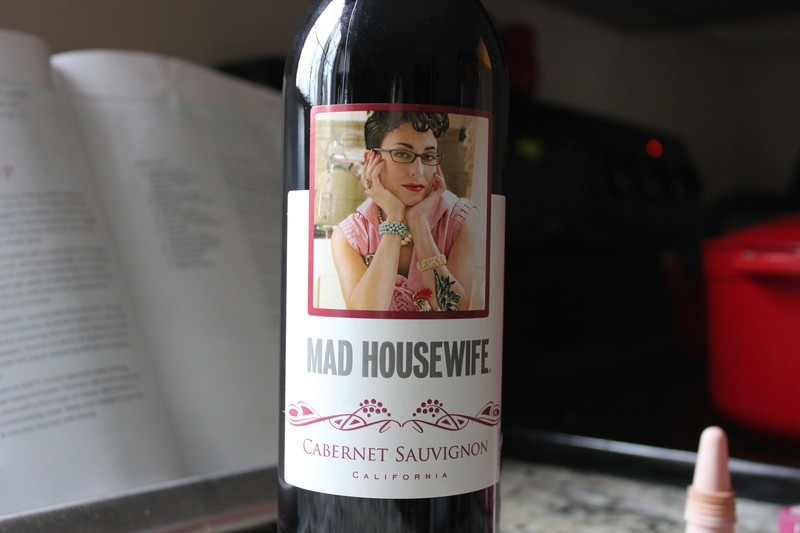 My husband picked this red wine for me based on the “cool label” and it met the “dry red” I asked for. Wine? Pssh. You’re here for the beer. What kind of beer should you use? I recommend darker ales and stouts. Smithwick’s is a good choice and you can’t deny Guinness is awesome for cooking. You can use any good Scottish ale or a nice stout. Porters and brown ales are a good choice too. I don’t like using IPAs because their hoppiness leaves the soup a little too bitter. In a large soup pot with a lid, melt the butter and olive oil over medium-low heat. While the butter and olive oil melt, slice the onions with a mandoline or use sharp knife so your onions are as thin as possible. Add the onions to the butter and olive oil and stir to coat. Cover and let cook for 15 minutes. Stir the onions and cover again for 15 minutes. Remove the lid and add the sugar and salt and raise the heat to medium-high. Continue cooking, stirring more frequently. Once the onions are a deep brown color and start sticking to the pot, reduce the heat to medium low. Sprinkle in the flour and cook 2-3 minutes. 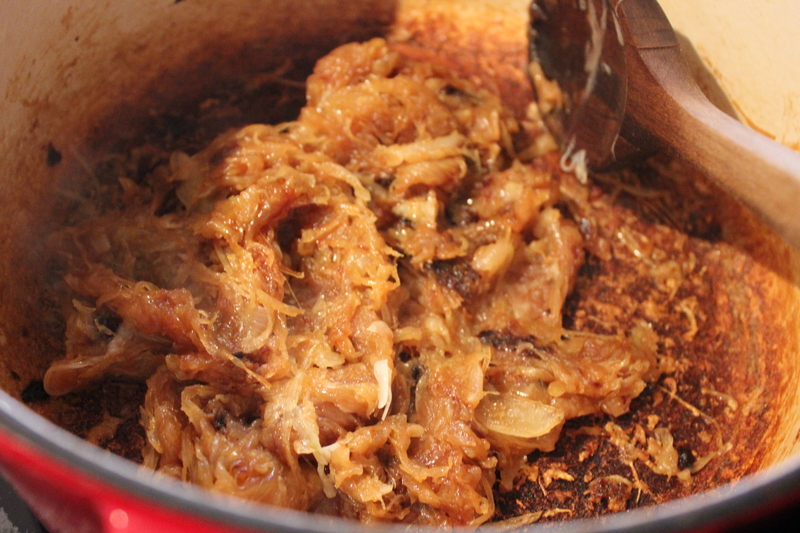 Add 1 cup of beef stock to deglaze the pot, scraping up the onions and brown bits stuck to the pot. Stir in the remaining stock, add in the alcohol and turn the heat to low. Cover the pot again and let the soup simmer for at least 30 minutes to combine the flavors. While the soup is simmering, heat the oven to 425 degrees. Cut the bread into cubes and spread out on a sheet pan covered with foil. Drizzle with olive oil and sprinkle with salt and pepper. Toast the cubes in the oven until golden about 5-8 minutes. Place the bread cubes in oven safe soup bowls. Ladle the soup onto the bread cubes and top with a generous amount of shredded cheese. Set onto a sheet pan covered in foil and bake for 10-12 minutes until the cheese is melted and browned to your liking. Let cool for 5 minutes, then enjoy!